Zootopia is the latest animated effort from Disney, whose resurgence and dominance in the world of animation continues without any risk of change anytime soon. 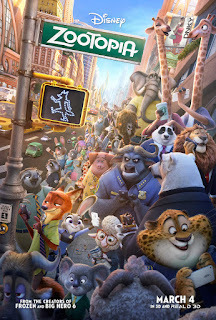 The film takes place in the eponymous city which is home to an array of animals who have evolved beyond instincts and naturalism into a civilised society; into the city arrives young bunny Judy Hopps (Jennifer Goodwinn), who achieves her dream job of a city cop but is often undermined by her peers for her less than intimidating appearance. She soon meets con artist fox Nick Wilde (Jason Bateman) and, in order to save her career, must work alongside an unlikely friend to solve a case that threatens the safety of all of Zootopia itself. The visual style of Zootopia is strongly influenced by it's main anthropomorphic characters, with each landscape across the titular city crafted on various animal themes and aesthetics. It's not as groundbreaking as it's been out to be by some, but the visuals are certainly as appealing as anyone would expect from a Disney flick, and the technical side of things is just as impressive; everything is fluidly and beautifully rendered and animated from start to finish as the main duo of Hopps and Wilde go on a standard buddy adventure across tons of detailed environments and meeting dozens of other characters. Although the narrative isn't so innovative upfront, the themes of prejudice and stereotyping are surprisingly complex and thoughtful for a modern animated flick, and it's evident the creators took their integration very seriously. From a sound design perspective, Michael Giacchino provides another entertaining score that compliments every scene, be it emotional, action packed, or comedic - it may not be the very, very best of his many works, but it's certainly a fine score nonetheless. The voice cast suit each character wonderfully, and it's once again nice to see Disney seeking out talented, varied actors instead of a bland lineup of A-listers to assist with marketing. Bateman and Goodwinn shine in the lead roles, and are backed by a strong supporting cast, with my notable favourites being Idris Elba and J.K. Simmons, even if the latter's role is disappointingly small. Zootopia shows that Disney has adapted into the modern conventions of animated filmmaking whilst also maintaining their classic charm; it parodies so much of the modern world in a comedic and political sense, but this never becomes overly pompous or patronising, and it's simplified enough for kids to extract the same morals without being too overwhelmed. Certainly, an original premise has been brought to the big screen with plenty of care and attention to detail, and while it is flawed in some areas of pacing, character development, and plot contrivances, Zootopia still shows Disney at the height of blockbuster animation once again.